It has come to our notice that, Assam Power Distribution Company Limited (APDCL) has made an announcement regarding AssamCareer.com. 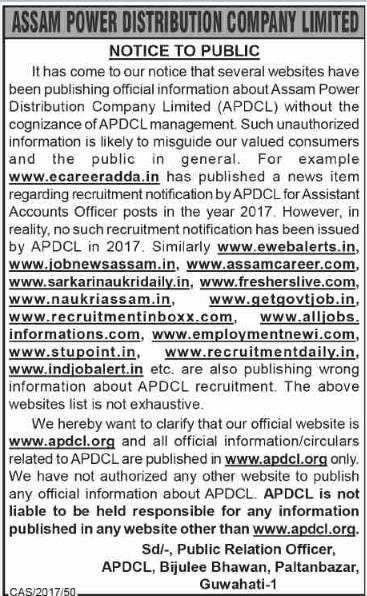 It states that AssamCareer.com has published a fake job notification regarding the recruitment of Assistant Accounts Officer in Assam Power Distribution Company Limited (APDCL) for the year 2017 on a public notice at Assam Tribune paper page 9, dated 5th July 2017. On thorough verification, we have seen, no, we repeat No such recruitment notification has been ever published in AssamCareer.com for the year 2017. So, it is totally a baseless and false allegation against AssamCareer.com . However, we made an announcement regarding Assistant Accounts Officer recruitment on 2015 only. That was a valid recruitment too.